The Matrix Token Swap begins tomorrow at 11am! Details inside. At long last, after countless hours of tireless effort, the Matrix Token Swap is set to begin. As previously announced, the token swap begins tomorrow — April 11th — at 11am (Beijing Time) using the Matrix Web Wallet. A detailed token swap manual can be downloaded on the official Matrix website. It is STRONGLY recommended to read the entirety of this manual prior to attempting the token swap. As most of you undoubtedly know, till now, MAN tokens were temporary ERC20 tokens built on the Ethereum network. The token swap consists of exchanging these temporary tokens for native MAN tokens that can be used on the Matrix AI Network. Though every token swap method has advantages and disadvantages, the Exchange-Assisted Swap is arguably the simplest method. If your ERC20 MAN tokens are stored in exchanges that support the Matrix Token Swap, then you don’t need to do anything. The exchanges will handle everything. As of this writing, KuCoin, Coinegg and GAEX will support the Matrix Token Swap on day 1. Bitfinex, LBANK, Huobi and Gate.io will also support the token swap. Each exchange will announce their own schedules and requirements. While the Exchange-Assisted Swap is the simplest method from the point of view of the token holder, this method creates a potentially awkward situation in the early-going. Please take careful note that, due to the fact that not all exchanges will support the Matrix Token Swap on day 1, there will be a period where both the ERC20 MAN token and native MAN token co-exist. As such, please be sure NOT to send your native MAN tokens to exchanges that only support the ERC20 token, and vice-versa. Using your Ethereum wallet address to complete the token swap using the Matrix Web Wallet requires you to manually input the Matrix Foundation Token Burn Account Address. You must ensure that you correctly input this address. You must also ensure that your Ethereum wallet has enough ETH to pay the gas fee. In order to ensure the safety and successful completion of the token swap, it will take approximately a day from the moment you send your ERC20 MAN tokens to receive your native MAN tokens. In a worst-case scenario, this process may take up to two days. This is because Matrix is using cross-chain technology to complete the token swap. To do so, Matrix is creating a mirrored Ethereum sub-chain. This part of the process is limited by the slow speed of the Ethereum network. You can refer to the Matrix Blockchain Browser or Matrix Web Wallet to verify your balance. The Matrix Web Wallet Auto-Swap method is only guaranteed to be available between April 11th, 2019 and April 21st, 2019. While tokens can still be swapped afterwards, you will need to either use the Exchange-Assisted Swap or Manual Swap methods. 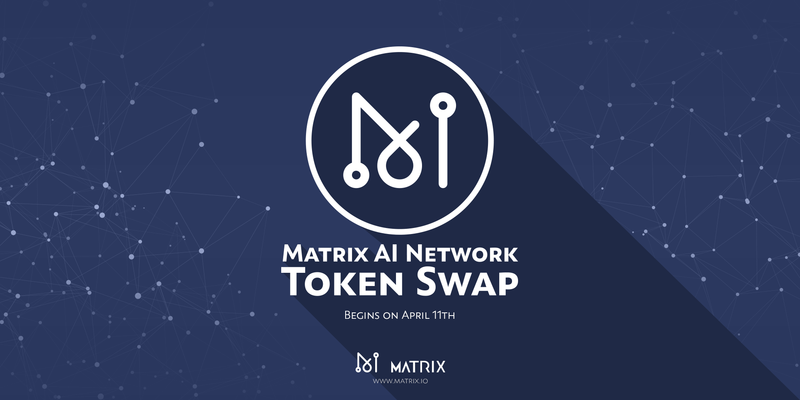 Although there is no token swap deadline, if you want to swap your tokens after April 21st, 2019 and do not want to use an exchange, you can send an email to tokenswap@matrix.io to arrange a manual token swap. Further details and procedures will be provided via email. send your tokens to an exchange that supports the Matrix token swap. first send your tokens to MEW, then complete the swap according to the steps outlined in the Matrix AI Network Token Swap Manual. As with all transactions, there is an element of risk with token swap transactions. There is also room for human error. As such, please be careful when completing every step of the Matrix Token Swap — especially if using the Matrix Web Wallet Auto-Swap method. The Matrix AI Network will not be responsible for any issues that arise during the token swap caused by user error. Additionally, please only try to complete the token swap according to methods officially sanctioned by the Matrix AI Network. The most recent Token Swap Manual can always be downloaded at https://www.matrix.io/downloads/. The token swap is an important milestone for both the Matrix team and the Matrix community. It is certainly very exciting. Nevertheless, the Matrix team urges everyone to patiently and carefully complete the token swap to avoid any mistakes. As previously mentioned, to remove some of the pressure to complete the swap as quickly as possible, the function to stake masternodes will not be open until April 13th, 2019 at 11am (Beijing Time)— two days after the start of the token swap. Thank you to everyone who has joined us on this adventure — old friends and new acquaintances alike! And thank you for carefully completing the Matrix Token Swap.